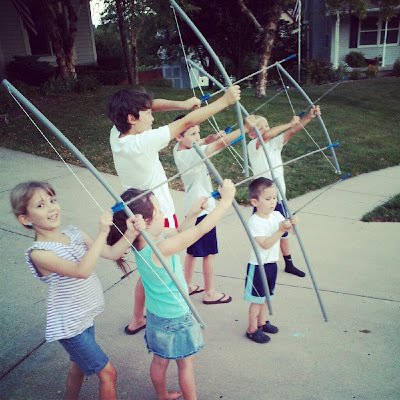 Home » crafts » Bow and Arrow! Today I want to share a quick tutorial on how to make a play bow and arrow – for under $1! – – amazing, right?!?! Enjoy this DIY Bow and Arrow for kids! You might have gotten a sneak peek of this project over at Trevor’s, aka Mr. Sugar Bee Crafts, blog : So I Married a Craft Blogger. (and if not, go check it out – his perspective is always funny). But basically I came home and the kids were all in bed, and he showed me this picture – I thought wowza, he’s super dad!! But of course, he didn’t do a tutorial or anything, so I tried to put something together for you after-the-fact. You need to buy 10 ft 1/2 in gray plastic conduit. You find it in the electrical department. But anyways, he bought 2 pieces, and his grand total was $2.12. Then on the way out, you’ll need some of the twine that’s free at the front of the store – normally used to tie down big things that you buy. He made 6 bows with that – so $0.35 for each bow, plus supplies we had laying around. Sweet. 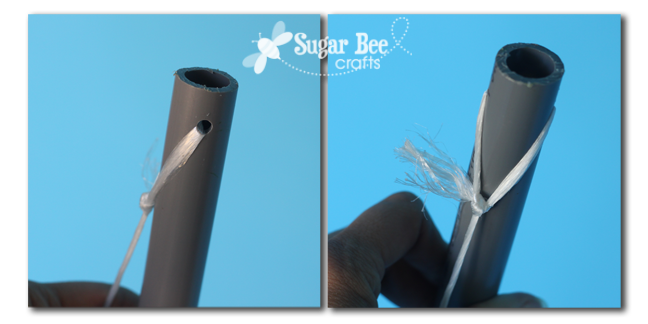 So, take the pipe and cut it into the desired lengths. 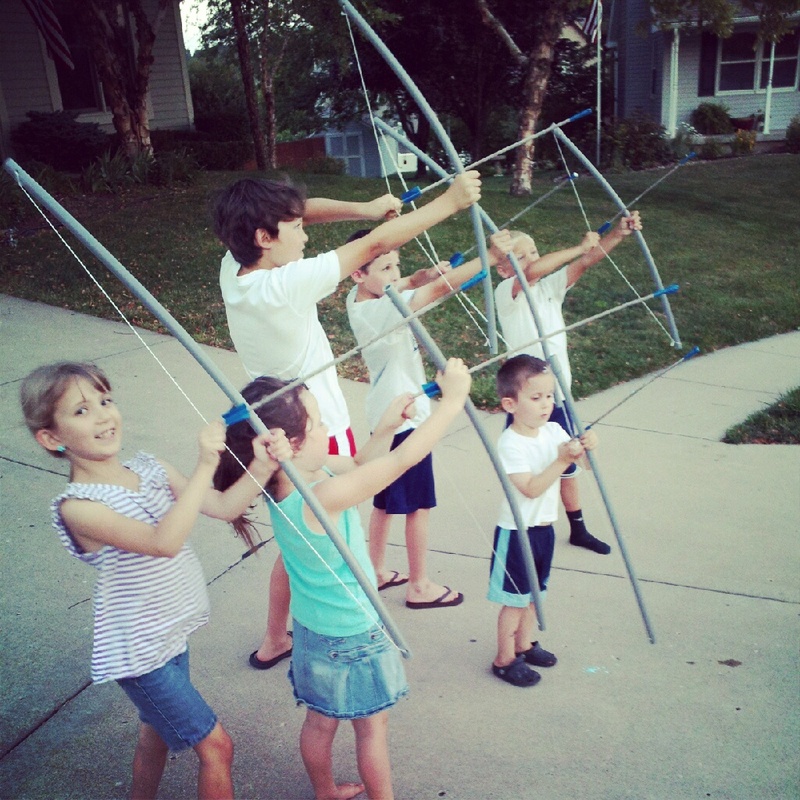 The taller kids have longer bows and the shorter kids have shorter bows – just guestimate. 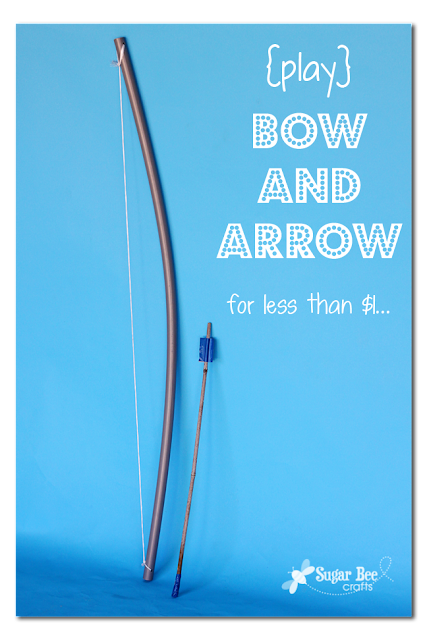 I have a super quick video for you, of the bow and arrow in action. They work surprisingly well. In the video, I loose the arrow in the sun, but it shoots clear across the street. Here ya go – get excited!! See, awesome, right?!? 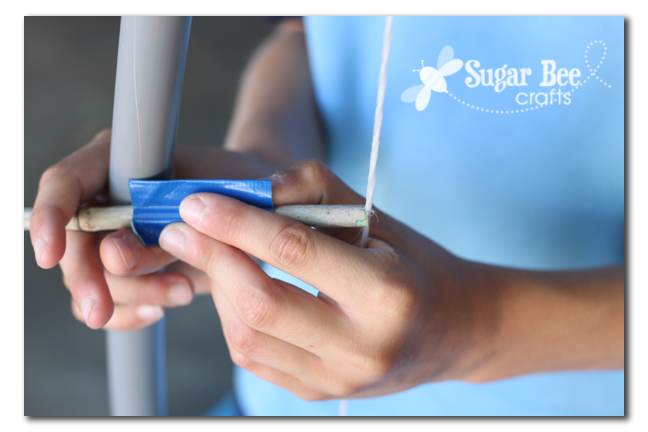 Enjoy making your own DIY Bow and Arrow for kids! I love both blogs now 🙂 i have a to do this!! My boy is going to love it for sure!! Trevor’s perspective is always funny! Awesome idea, thanks for posting! 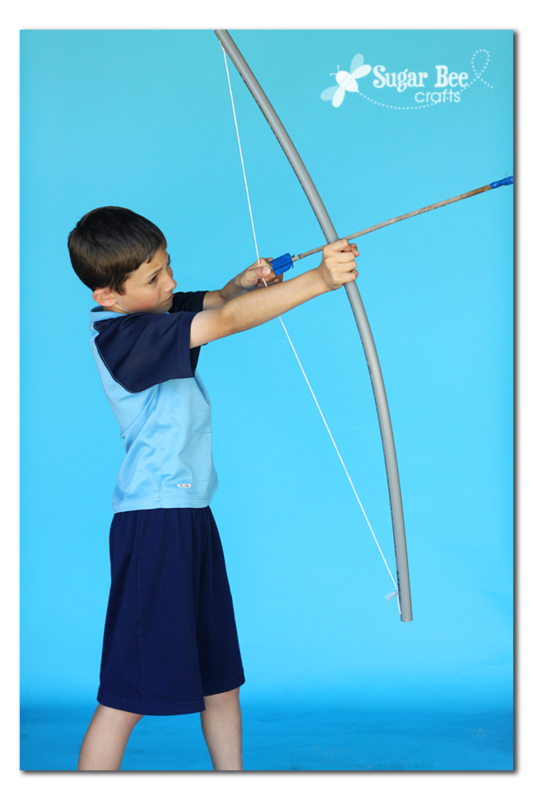 I may be planning a party based on the movie Brave and so far all I know about it is that she shoots a bow and arrow- so these will be perfect for the party! This is a great idea! Thanks for the tutorial on how to make this. I think it will be great for the kids! Coolest project. We’re trying to talk Mark into this one. The boys (and KARA) think this would be an awesome addition to their summer. You already know how much I love this but I had to stop in and let you know I featured it today. 🙂 Thanks for linking up with What are little boys made of. I cannot get the string to work? it stretches out, or the twine i got just breaks? ( i have tried: stretch cording, plastic craft lace, and brown sisal twine) … all are not working. I hope you get this our party is in 3 days!!! Help, what exactly do I need and where can I buyit? Nice blog and kids are very creative. I like your blog and your work.